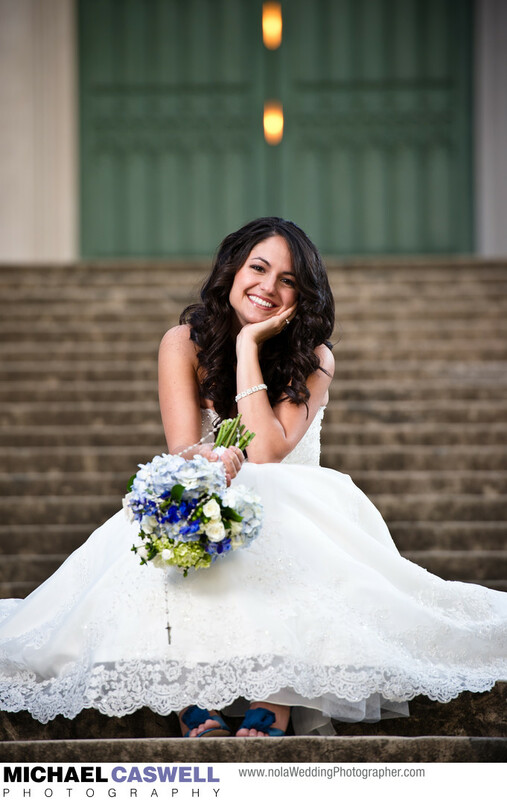 This bridal portrait photograph was taken in Baton Rouge on the steps of the Old State Capitol building downtown near the Mississippi River. This castle-like Gothic Revival structure was built around 1850, but fire during the Civil War destroyed the interior. It was completely refurbished after the war, and continued its service as the seat of Louisiana's government until 1932, when the new (and much taller) Capitol building opened a few blocks away. Today, the Old State Capitol serves as a museum, and also plays host to weddings and other special events. The surrounding area features numerous great spots for bridal and engagement portraits. This was one of the bride's favorite images from the shoot, and was also selected to be published as the cover of The Advocate's Weddings 2011 special section after the editor, attending as a guest at the wedding, saw the bride's framed enlargement on display during the reception at Louisiana State University's Lod Cook Alumni Center.